I wanted to make a tissue box cover to have at work. 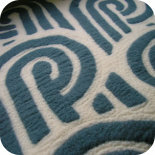 I found this really cute pattern at moogly. The tissue boxes we get in the office are those not-very-tall ones. I wasn’t sure if the whale shape would work but decided to give it a go anyway. 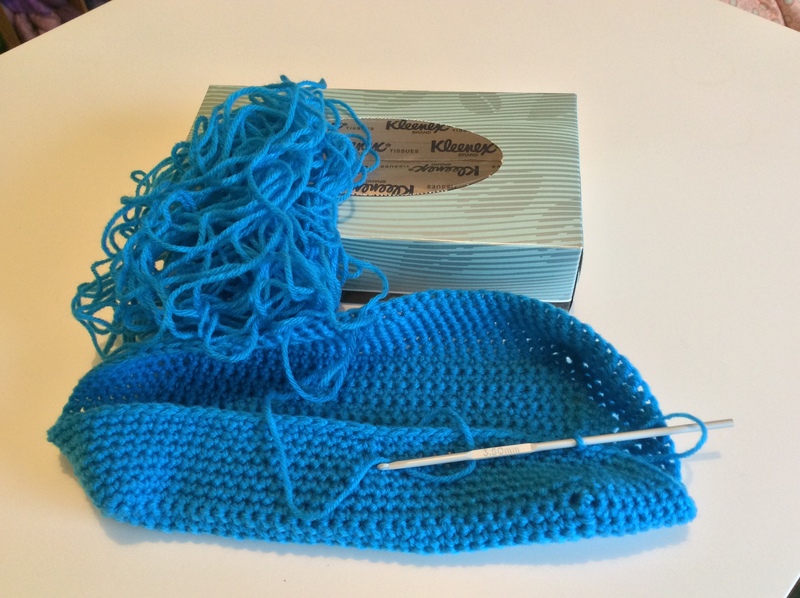 Turns out I had just the right shade of blue in my stash. 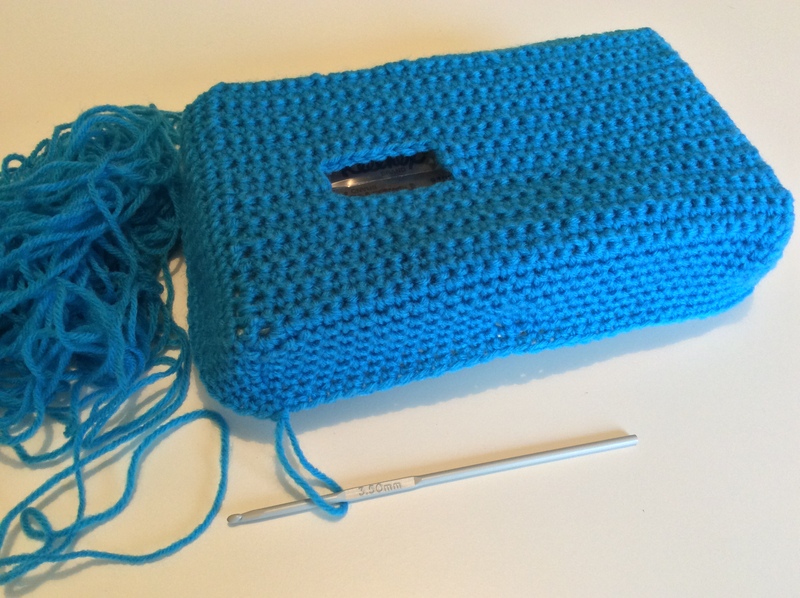 It’s a synthetic yarn so it has good grip and was pretty easy to work with. I strayed from the pattern a little bit because I didn’t want the blow hole to be the length of his body. So I made just a smallish blow hole – big enough for the tissues to come out and positioned more toward the front of his head. I also made a mistake with the tail which I couldn’t be bothered fixing and I think it turned out to be a happy accident—I was very happy with the way the shape and angle of the tail turned out. I embroidered the mouth and used some buttons from my stash for the eyes. Can’t wait to take him to work on Monday! In Row 9, instead of re-joining the yarn 7 stitches before the end of the row, I joined 18 stitches before the row. Then in Row 12, I chained 8 stitches so this left a much smaller gap for the blowhole. As for the height, the pattern says to do Rounds 22-39 and I just stopped when the whale fit the height of the tissue box. I had the tissue box handy and just kept fitting the whale on until it looked right. I hope this helps. Good luck with your whale! 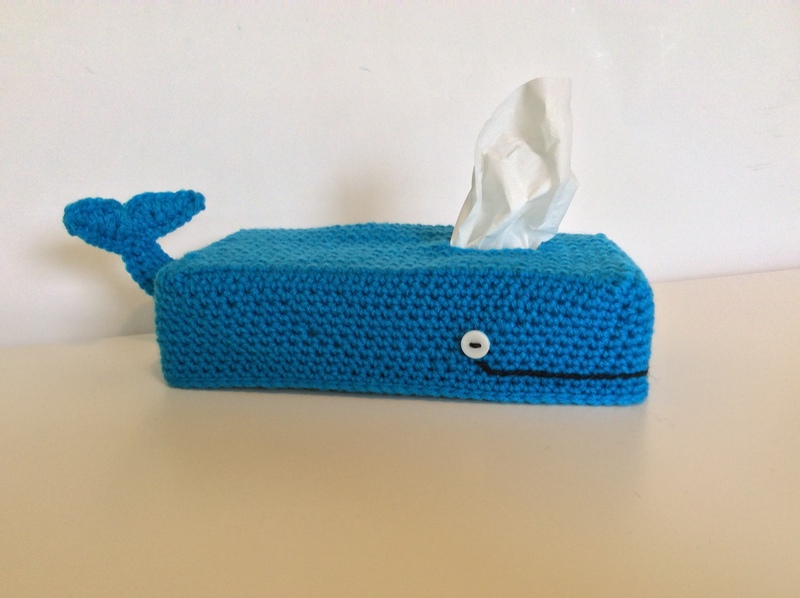 This entry was posted on 10/01/2015 by flicstar in Homeware and tagged crochet, crochet whale, tissue box cover.